In the WinNMP Manager window, go to Project Setup, check Enable Local Virtual Server, then Save. 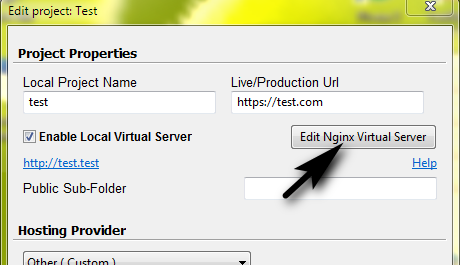 Edit WinNMP\conf\domains.d\projectName.conf directly or go to Project Setup and click on Edit Nginx Local Virtual Server Configuration File icon. # Add trailing slash to */admin requests. # This try_files directive is used to enable SEO-friendly URLs for OpenCart.